A lot of dogs that are rescued from homeless or abusive living situations do, somewhere within them, know how to love — they're just afraid to let themselves. But how does a dog function when it has never known affection? Benji was one of those animals. Having been homeless his entire life, as the Hope for Paws video below indicates, the dog had no idea how to respond to his rescuers' touch, aside from fear. The video shows how the rescuers had to run after the animal, then catch it with a snare. Watching it struggle is excruciating, but even worse than that is seeing the condition the animal is in. "This is one of the worst mattings I've ever seen in my life," the rescuer says as he gives the dog what might be his first comforting touch ever. 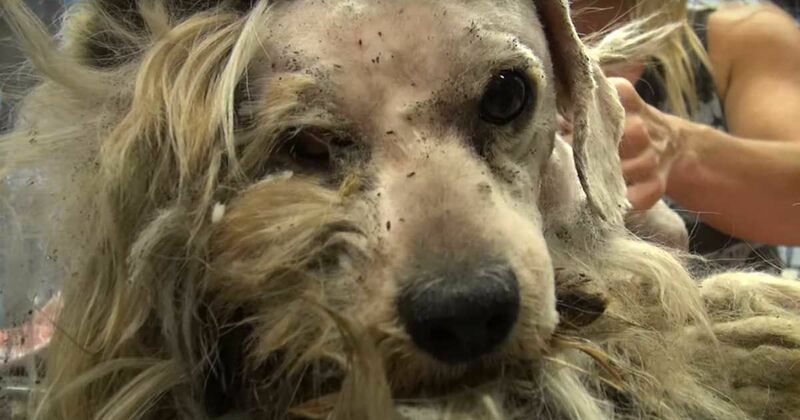 Not only was the dog's fur terribly matted, it was also infested with pests. When the rescuers shave away Benji's hair, the amount of fleas and other bugs that crawl out of it is staggering. After the dog was shaved and cleaned, the hard part came — teaching him to love. Lisa Chiarelli, one of Hope for Paws' volunteers, took him home with her to meet Lola and Frankie, two other rescued dogs who frequently intervene in the organization's attempts to familiarize new rescues to canine company. It took Benji over 10 days to open up, as he was completely "shut down," as the video says, too afraid to move or return the affection he was receiving. Watch the video below to witness his beautiful transformation. No dog should have to go through this — share this video to spread that message.